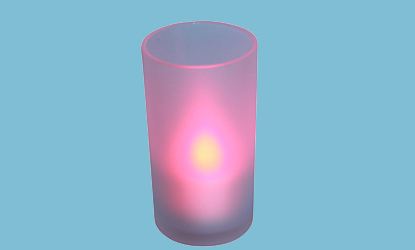 Create an atmosphere to suit with these colour changing battery operated tea light candles. Safe and easy to use, just switch on and place back in the frosted glass for a cosy atmostphere where falling asleep won't set the place on fire. These battery operated candles are great for festive christmas decorations and as night lights for childrens rooms. The colour changing candle light are also great for summer garden parties or even camping and festivals, though they are obviously not water or beer proof.